Zhoujia Village of Lujiao Town is located in Pengshui County, Chongqing. The village has 8 villagers groups with a population of about 2,500. 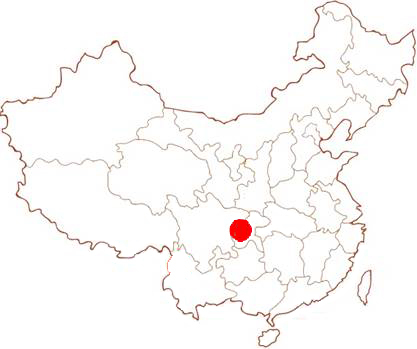 They are mainly Tujia and Miao peoples. The per capita net income is about 3,000 yuan. Young generation are mostly migrant workers. The elderly and children are left in the village and their living conditions are very difficult. There is a walking path of about 500 meters in the village. The roads are accumulated rain water and inaccessible in rainy days. The villagers use stepping stones to cross the river. They could not pass through when the rain is heavy. 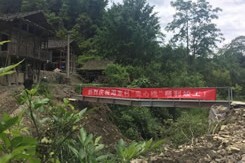 When necessary, they needed to walk around 3km mountain road instead to reach the other side of the river, which caused great inconvenience to the production and life of the villagers. Therefore, the villagers eager to have a new footbridge to solve their commutation problem. About 450 people benefit from this solution. 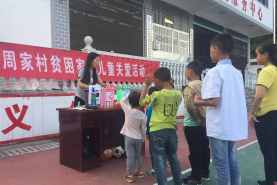 On 5 June, 2018, under the assistance of the villagers, "Yi Xin Qiao" of Zhoujia Village was successfully completed. The bridge is 14 meters long. 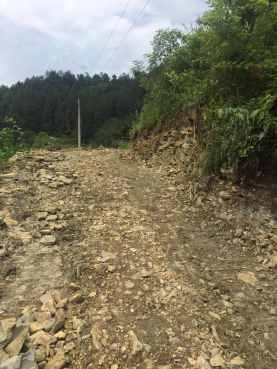 Meanwhile, the team also built a 0.5 km long road for the villagers to solve their commutation and agricultural machinery transportation problem. . In addition, the team carried out health education and garbage sorting activities in the village to educate the children to develop healthy habits from an early age. The team conducted the 1st investigation trip in Jan and initially proposed to design a 14-meter footbridge for the villagers.